British author Kate Atkinson wrote the Jackson Brodie private investigator series. I use the term “series” loosely, since Jackson barely appears in some of the books. Beginning with “Case Histories,” Atkinson’s series is quirky and full of insight, human drama, and plot twists. Life after the series hasn’t been too shabby for Atkinson. Her “Life After Life,” the previously published companion to “A God in Ruins,” was nominated for various awards, won the Costa Award, and appeared on “best books of the year” lists, but it would be a far stretch to call it a mystery. 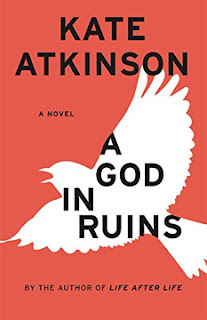 So, too, “A God in Ruins” is a surprising novel done with her trademark twists, but it is not a mystery either. That is not to say that Teddy’s story is told in a linear stream, any more than Ursula’s was in “Life.” However, for the most part, Teddy just has one life to live. We learn about Teddy in snippets that move back and forth in time. At the center is when Teddy was a World War II pilot. His philosophy, optimism, and view of human nature were profoundly influenced by what he saw and did. This is a quiet and gentle existential novel. Linearally speaking, Teddy grows up in a big family, his mother is a clueless upperclass woman, he marries the girl next door after a distinguished wartime career as a pilot, his only daughter, Viola, is a self-involved hippie, and his grandchildren are searching for their purpose in life. Does it diminish the anxiety when reading about Teddy’s wartime exploits to know that he lives to a ripe old age? No. Does it affect how we feel about Teddy when we see Viola’s vapid character exposed? No. Are we confused about the timeline? Atkinson takes great pains to make sure there are reference points, so the answer is no. Some excursions back in time are expressed as reminiscences and sometimes the steps forward are parenthetical, so you know how karma bit someone in the posterior (or not). But mostly various periods of time take turns as the main focus, with discursions and parentheses to take the reader forward or backward from that point. It sounds confusing, but it isn’t. That’s a mark of how good Atkinson is. The last fifty or so pages are worth their weight in gold. It is the end of the line for Teddy, and Atkinson handles it poignantly and with dignity. A sociopath dressed immaculately and with a mild manner is still a sociopath. Isn’t it the current topic du jour that some of the most effective business leaders have sociopathic tendencies? So sociopathy is now trendy. Just as people used to strain to claim ancestors on the Mayflower, do they now strain to find a touch of misanthropy? 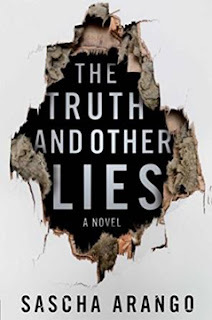 Perhaps such people can find a champion in Henry Hayden, the deliciously askew main character in “The Truth and Other Lies,” German author Sascha Arango’s first novel. Henry is an author of bestselling thrillers. But not really. His wife, Martha, actually writes them, compulsively working on them in her upstairs lair. She wants no recognition. Luckily, Henry is comfortable with accepting the accolades. He also indulges in what fame and money can buy: a Maserati, fine clothes, exquisite food, a mistress. After Henry met Martha, he emerged from a cocoon he had created for himself after a troubled childhood and delinquent adolescence. He cooked for her and coddled her. She wrote her books and made him famous. After Henry met Betty, an employee at his publishing company who fortuitously discovered his first book in a slush pile, they became lovers. After Betty became pregnant with Henry’s baby, Henry found himself teetering on the proverbial horns of a dilemma: ditch his paycheck or his beautiful amanuensis. If pushed, he could not admit to actually caring about either of them. The bodies start to accumulate. Whether by design, accident, or illness, they slouch and drape and crumple and otherwise litter the landscape. We know what Henry has to do with each body, because it is his viewpoint we follow. But we are initially less knowledgeable about Gisbert Fasch, Henry’s stalker, and Inspector Jenssen, the at-first adoring and then suspicious detective assigned when Martha is reported missing. Arango does a superb job of creating a man who accepts his lack of emotion and determines how to survive by creating a simulacrum of a normal person. One by one he ingeniously dodges the various problems that are thrown his way, but will he survive the ultimate test, worming his way out of a charge of murder? There is no silence like another person’s absence. Drained of anything familiar, it is a silence that is hostile and reproachful. What distinguishes policemen from criminals or civilized people from barbarians apart from the brutality of their instincts and the consistency of their breakfast eggs? Henry had led a secret life — somewhere and somehow. That in itself was an achievement, for vanishing is an art. It means renunciation and abstention. Henry’s character is crystal clear. The important people in his world are also distinctly designed and so very interesting. Henry Hayden can join the fine company of Patricia Highsmith’s Ripley and Jeff Lindsay’s Dexter as an intriguing, twisted character we are glad we aren’t meeting in a dark midnight alley. I have such mixed feelings about “The Kill.” There have been five novels so far in the DC Maeve Kerrigan series, and this is the latest. I read “The Burning,” the first in the series, and while I wasn’t jumping up and down about it, I liked it well enough to try again. I missed the next three in the series — which some might say gives me a skewed look at the the fifth — but it wasn’t too hard to get the gist of what I had missed. 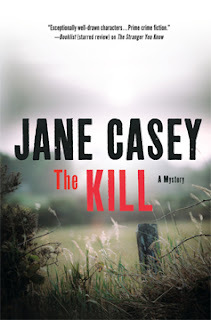 Once again, I think Jane Casey has presented another interesting story and my quibbles might just be cranky mutterings. This is a gothic novel dressed up as a police procedural. Maeve’s work partner, DI Josh Derwent, is Rochester and Maeve is Jane, the pure and innocent maiden. Having said that, Maeve has a boyfriend, another cop, and she is only vaguely hapless. (So much for that analogy.) Frankly, if Derwent were my Rochester, I would leave immediately with no forwarding address. Derwent is obnoxious, arrogant, secretive, and demeaning towards Maeve. He tells her constantly that he has her best interests at heart and runs interference for her. Maeve’s loyalty and gratitude to him are the unlikely givens which must be accepted in order to continue. Talk about Stockholm Syndrome. Maeve herself is no shining star. She blushes and cries at the drop of a hat. Maybe this should come across as vulnerable and appealing, but it doesn’t. (Maybe I should have read the intervening two novels, because I can’t see how she got as far as she did in her career without more mental toughness.) She talks about loving (in a loyal detective/daughterly sort of way) her boss, Charles Godley, and how Derwent loves him too, and she will shamelessly say this out loud to Godley and Derwent. Get a grip, girl! I will get a grip as well. Maeve and Derwent work in London. When a cop, Terence Hammond, is found dead in his car, shot by a sniper, they are part of the team that catches this case. Upon closer inspection, Hammond turns out to be a loser. He has a chilly wife, a disabled son (whose disability he caused), and a rebellious daughter. Plus, Hammond wasn’t alone in the car when he was shot. Maeve’s keen eye (not being sarcastic here; Maeve does spot-on detecting throughout) determines there was a woman, shall we say, keeping him company. When another cop is murdered, someone with no link to Hammond, the entire force goes on high alert. But it’s not enough to prevent even more killings. Is this tied to the killing of an unarmed teen by a cop? (What a timely topic for us in the U.S.!) The story moves along very well, and I have only respect for how Maeve alone unravels a big piece of the plot. In fact, there are many scenes that are well done, including a moving scene with the mother of the dead teen. Casey seems to say that yes, Maeve is attractive — for all the good and bad that does her — and emotionally labile, but she’s also smart and that is what got her to where she is. Just hand Maeve a tissue and let’s get on with it. When each chapter has a title beginning with the words “in which,” as in, for instance, “In Which There are Some Things You Can’t Let Pass,” one can assume that there’s an interesting ride ahead. “Total Chaos” is the first in what has been billed the “Marseilles Trilogy.” Jean-Claude Izzo crafted a noir-inflected, jazz poem, and a look at the French port city of Marseilles, seen through a lover’s — Izzo was an ardent fan of his home city — eyes. Izzo paints his city for us. It has the bright hues of the Mediterranean and the dark shadows of the immigrant world. Placed in Marseilles of the 1990s, the recession has hit the enormous immigrant communities especially hard. The waves of foreign people have produced citizens who are neither French nor a part of the culture they or their families fled. In times of economic stress, racism finds fertile ground, Izzo’s story says. Marseilles isn’t a city for tourists. There’s nothing to see. Its beauty can’t be photographed. It can only be shared. It’s a place where you have to take sides, be passionately for or against. Only then can you see what there is to see. And you realize, too late, that you’re in the middle of a tragedy. An ancient tragedy in which the hero is death. In Marseilles, even to lose you have to know how to fight. Fabio Montale, our police detective hero, comes from such an immigrant family. He grew up with other outsider kids in a ghetto. Now there are many Arab and African immigrants in various ghettos as well, and they are part of a tribe lost to the uncertainties of Marseilles. Written before 2001, “Total Chaos” presages the inequities and vilification Arab communities face. Izzo presents a passionate look at prejudice. As a kid growing up in the ghetto, there are only two major ways out: crime or the military. One of Montale’s childhood friends chose crime, and he died because of it. 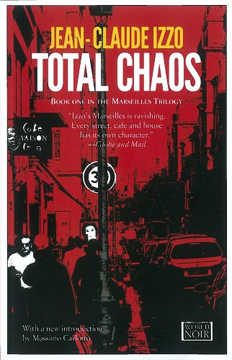 Ugo, Montale’s other best friend, came back from traveling the world to avenge Manu's death. Not surprisingly Ugo, too, meets a violent and excessive end. Although Montale chose the military and then police work, he hesitates only briefly before embarking on an investigation that may result in a resolution that skirts proper procedure. In between swilling his Lagavulin and listening to American jazz, he uncovers the criminal world that Manu embraced. There are locals. There are foreigners. There is a rich, barely tapped field of drugs, prostitution, and illegal firearms. But mostly there is a demand made on his honor to avenge his friends. And there are women. Ah, les femmes. Montale may have a simple and sterile personal life when he is not working, but he has a dizzying number of women who are attracted to him. Alas, he cannot return their affection because his “ideal” woman, he fears, may not exist. Izzo has given us a work of grace and beauty that rests in a hard-edged, violent environment. P.S. To hold a book by Europa is to hold a work of art and sensory satisfaction.